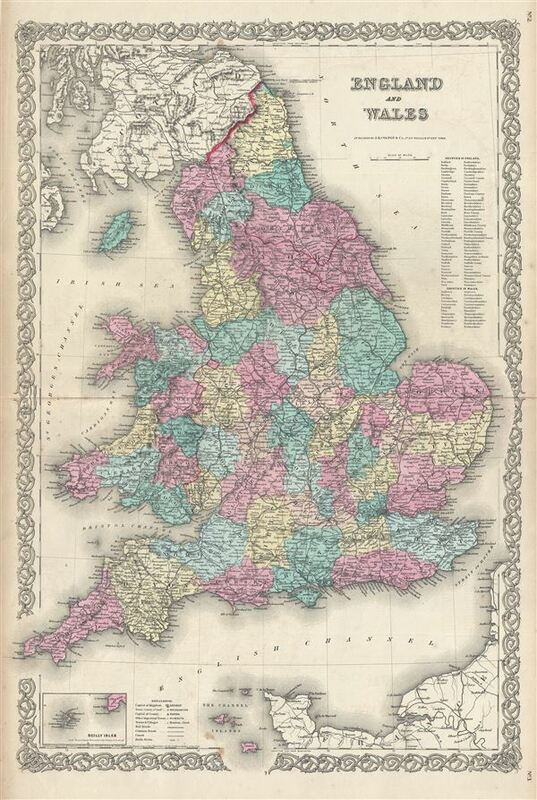 An excellent 1855 first edition example of Colton's map of england and Wales. Like most of Colton's europe maps, this map was derived from an earlier wall map of The World produced by Colton and D. Griffing Johnson. The map covers both england and Wales in full from Scotland south to the english Channel and The Channel Islands, and from St. George's Channel to the mouth of the Thames River, including the Isle of Man. An inset on the bottom left corner details the Scilly Isles. Also shows a part of France. During this time, both england and Wales were in the midst of the Industrial Revolution wherein much of the rural agricultural population relocated to urban centers. This map also identifies various cities, towns, forts, rivers, rapids, mountain passes, fords, and an assortment of additional topographical details. Map is hand colored in pink, green, yellow and blue pastels to define national and regional boundaries. Surrounded by Colton's typical spiral motif border. Dated and copyrighted to J. H. Colton, 1855. Published from Colton's 172 William Street Office in New York City. Issued as page nos. 2 and 3 in volume 2 of Colton's 1856 Atlas of the World. Very good. Blank on verso. Even overall toning and some spotting. Verso repair along centerfold. Rumsey 0149.070 (1856 edition). Phillips (Atlases) 816.